1. 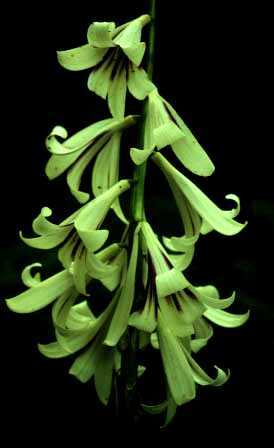 Cardiocrinum giganteum (Wallich) Makino, Bot. Mag. (Tokyo). 27: 125. 1913. Bulbels 3.5--4 × 1.2--2 cm. Stem erect, green or dark green, 1--3 m × 3--5 cm, hollow. Leaves on proximal 1/2 of stem larger, those on distal 1/2 much smaller, sometimes bractlike; petiole 15--20 cm; leaf blade ovate-cordate, 15--20 × 12--15 cm. Raceme 10--16-flowered; bracts caducous. Tepals white or tinged with green, streaked with purple or purple-red adaxially, linear-oblanceolate, 12--15 × 1.5--2 cm, apex obtuse. Stamens 6.5--7.5 cm; filaments slightly widened toward base; anthers ca. 8 × 2 mm. Ovary 2.5--3 cm × 4--5 mm. Style 5--6 cm. Capsule subglobose, 3.5--4 cm in diam. ; apex beaked. Seeds ovate-deltoid, 4--5 × 2--3 mm. Fl. Jun--Jul, fr. Sep--Oct.
Forests, hillsides; 1200--3600 m. Gansu, Guangdong, Guangxi, Guizhou, Henan, Hubei, Hunan, Shaanxi, Sichuan, S Xizang, Yunnan [Bhutan, NE India, Myanmar, Nepal, Sikkim].